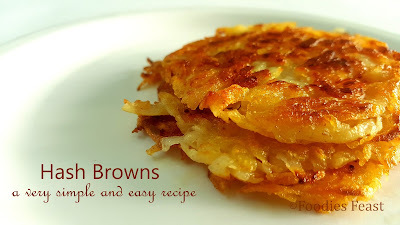 Its a very simple recipe to make hash browns which are very crisp on the outside and soft inside. Firstly, let us know what exactly hash brown refers to. According to wikipedia, Hash browns are a simple preparation in which potatoes are pan-fried after being shredded, diced, julienned or riced. Hash browns are the staple breakfast food in North America and the UK. In some countries Hash Browns are made with fully cooked potatoes, whereas in others they are parboiled or even used raw. 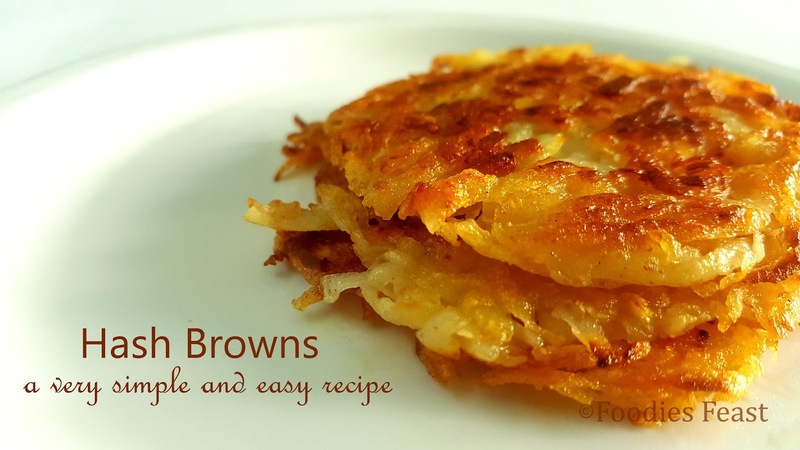 I always like to keep my recipe simple and easy, so, I make these hash browns using raw potatoes. For making the hash browns, all you need are potatoes. Yes, but the potatoes have to be non starchy. Now, how would you know that the potatoes are non starchy. The non starchy potatoes are the ones with a thin skin. Do not go for the old potatoes as they have more starch in them. Also, the non starchy potatoes can hold their shape whereas the others cannot, so it is important that you use the non starchy potatoes. Now, lets begin with the recipe, and first the ingredients. Peel the potatoes and wash them. Pat dry them with a kitchen towel. Grate them with a grater. Squeeze out the water from the potatoes by pressing them with your hands. Now, add salt and pepper to taste. Remember we are using salted butter for frying so add in salt accordingly. Heat butter in a pan. Take a small portion of the grated potatoes and give it the shape you want, I prefer round, so I have made it round. You can also apply oil to your hands before shaping the grated potatoes. Put it in the pan and press it gently with a spatula. Let it cook on medium flame. It will take time as the potatoes are non starchy. And hence would be crisp on the outer surface. Flip it once the bottom has turned nice golden brown. And similarly cook the other side. And your hash browns are ready. You can make it for your breakfast or even pack it in the tiffin for kids. It goes best with omelette and tomato ketchup. Cook it on medium flame. As the high flame would turn your hash browns black. Squeeze out the water completely. As the water would not let the hash brown strands to be intact and hence will not retain its shape and would break. If you are using salted butter for frying add less salt in the potato mix. So for a change forget your paranthas, idlis and pohas for breakfast and try out these very yummy crisp hash browns and let me know your experience and suggestions via comments.